Preheat grill to medium heat. 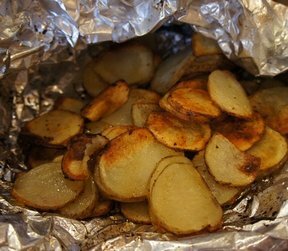 Place cut (however you prefer) potatoes in center of 18" long piece of heavy duty aluminum foil. Drizzle with water and oil. Bring up foil sides and double fold top and ends to seal packet leaving some room for heat to circulate inside. Grill 18-20 minutes or until potatoes are tender. Cut slits in foil to release steam. 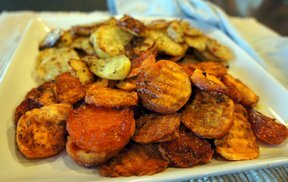 Open packet and drizzle potatoes with dressing. Sprinkle with parsley and cheese.